Download "Unlocking the Potential of the Social Economy for EU Growth: The Rome Strategy"
1 Unlocking the Potential of the Social Economy for EU Growth: The Rome Strategy Based on the Proceedings of the Rome Conference, November 17 and 18, 2014 On the occasion of its Presidency of the EU Council, the Italian government took the opportunity to promote a dialogue between social economy organisations, national and local governments, and European institutions a dialogue that in recent years has seen a plurality of actors working to define and promote the role of the Social Economy for European growth. The conference Unlocking the Potential of the Social Economy for EU Growth, held in Rome on the 17 th and 18th of November 2014, has seized the opportunity provided by the beginning of the new European Parliament s and European Commission s mandate in order to identify the areas of intervention deemed necessary by the varied actors who have worked to promote the spread and strengthening of the Social Economy as a key driver of economic and social development in Europe. 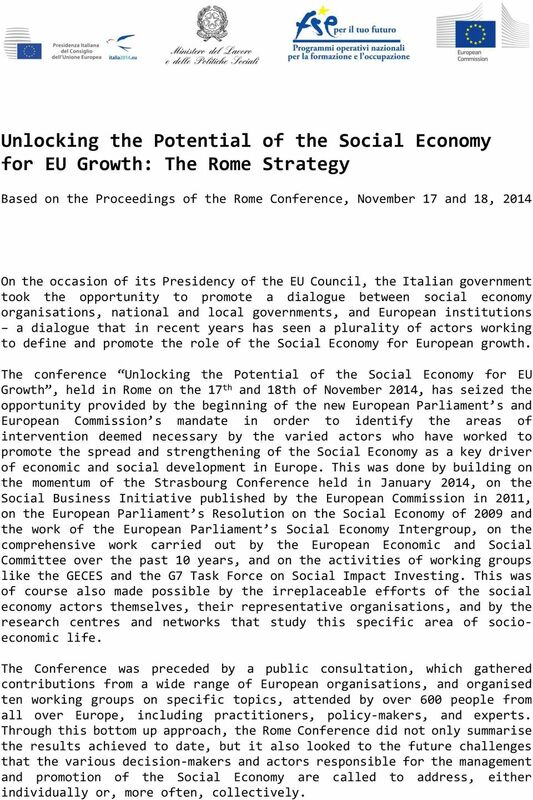 This was done by building on the momentum of the Strasbourg Conference held in January 2014, on the Social Business Initiative published by the European Commission in 2011, on the European Parliament s Resolution on the Social Economy of 2009 and the work of the European Parliament s Social Economy Intergroup, on the comprehensive work carried out by the European Economic and Social Committee over the past 10 years, and on the activities of working groups like the GECES and the G7 Task Force on Social Impact Investing. This was of course also made possible by the irreplaceable efforts of the social economy actors themselves, their representative organisations, and by the research centres and networks that study this specific area of socioeconomic life. The Conference was preceded by a public consultation, which gathered contributions from a wide range of European organisations, and organised ten working groups on specific topics, attended by over 600 people from all over Europe, including practitioners, policy-makers, and experts. 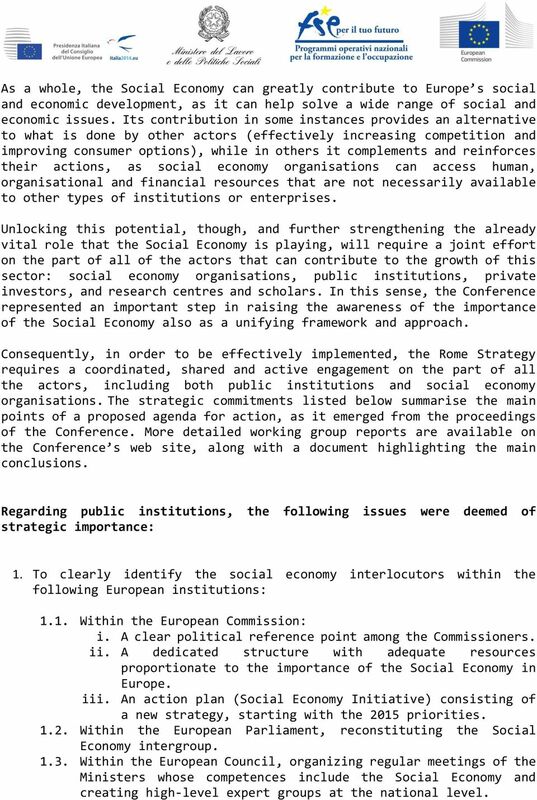 Through this bottom up approach, the Rome Conference did not only summarise the results achieved to date, but it also looked to the future challenges that the various decision-makers and actors responsible for the management and promotion of the Social Economy are called to address, either individually or, more often, collectively. 2 The discussion that took place at the Conference highlighted in particular the extent to which the Social Economy, despite being composed of a plurality of organisational forms each with their own history and specificities based on the diverse national and historical contexts, is indeed an area with clear common characteristics, brought together by the goals it pursues. Indeed, the term Social Economy refers to a universe of organisations based on the primacy of people over capital. Their aim is providing goods, services or jobs to their members or to the community at large with a long-term perspective, with the participation of membersstakeholders in the governance of the organisation, and through the reinvestment of profits in their mission. This universe includes organisational forms like cooperatives, mutuals, foundations and associations, as well as newer forms like social enterprises, in the various meanings that this term takes on in different cultural and geographic contexts. Social Economy is thus an expression that unites a large and rich variety of entities that contribute to pluralism in markets around the world and underlines the particular attention that these organisations pay to the economic and social dimension of their activities. In fact, social economy organisations generally adopt working methods based on cooperation and reciprocity, and as such they are characterised by democratic governance and transparent models that are able to guarantee the participation of a wide array of key stakeholders in society (producers, consumers, users of services, workers, communities, parents, account holders, etc.). Their governance structure generates trust in those that participate in their activities - a fundamental condition for the survival and future development of the European social model. The Conference confirmed that the Social Economy, thanks to its defining characteristics, contributes to economic growth and is already playing a vital role in all European countries. The Social Economy is contributing to the implementation of several key EU objectives, such as employment creation and retention, social cohesion, social innovation, rural and regional development including international cooperation and development, environmental protection, etc. Indeed, its role has become even more significant in recent years, as social economy organisations have proved to be a major anti-cyclical force in confronting the economic crisis affecting our continent. The Conference also showed that the range of action of the Social Economy is expanding beyond traditional sectors of activities and increasingly including new sectors characterised by a particularly high level of social impact as well as job creation potential, such as welfare and social services, the integration of disadvantaged workers, environmental services, leisure and tourism, and even energy distribution, to name a few. 3 As a whole, the Social Economy can greatly contribute to Europe s social and economic development, as it can help solve a wide range of social and economic issues. Its contribution in some instances provides an alternative to what is done by other actors (effectively increasing competition and improving consumer options), while in others it complements and reinforces their actions, as social economy organisations can access human, organisational and financial resources that are not necessarily available to other types of institutions or enterprises. Unlocking this potential, though, and further strengthening the already vital role that the Social Economy is playing, will require a joint effort on the part of all of the actors that can contribute to the growth of this sector: social economy organisations, public institutions, private investors, and research centres and scholars. In this sense, the Conference represented an important step in raising the awareness of the importance of the Social Economy also as a unifying framework and approach. Consequently, in order to be effectively implemented, the Rome Strategy requires a coordinated, shared and active engagement on the part of all the actors, including both public institutions and social economy organisations. The strategic commitments listed below summarise the main points of a proposed agenda for action, as it emerged from the proceedings of the Conference. More detailed working group reports are available on the Conference s web site, along with a document highlighting the main conclusions. Regarding public institutions, the following issues were deemed of strategic importance: 1. 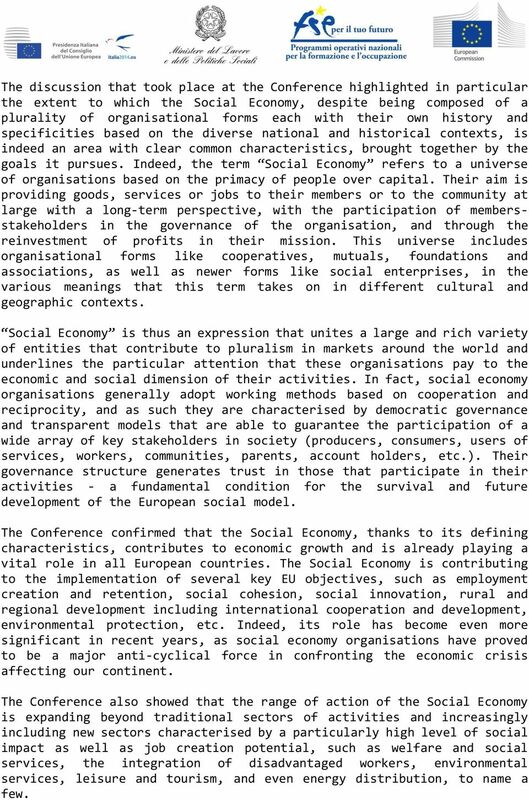 To clearly identify the social economy interlocutors within the following European institutions: 1.1. Within the European Commission: i. A clear political reference point among the Commissioners. ii. A dedicated structure with adequate resources proportionate to the importance of the Social Economy in Europe. iii. 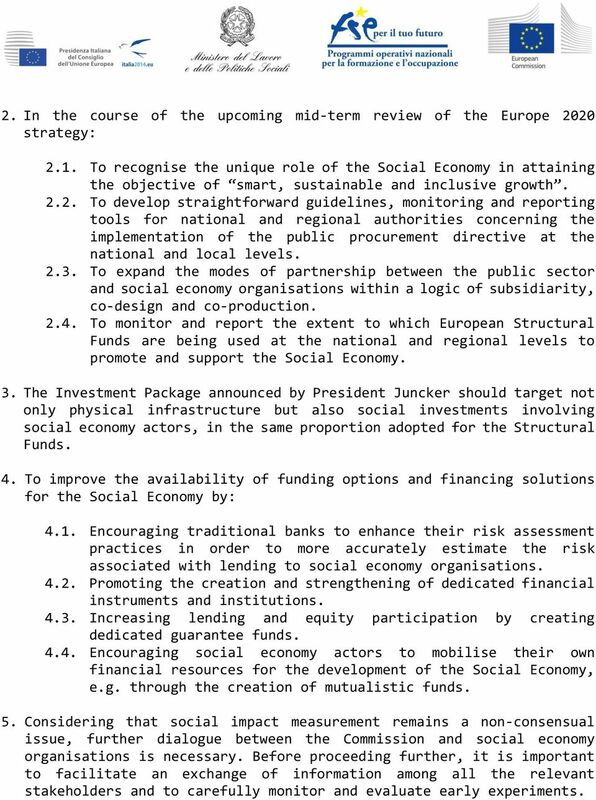 An action plan (Social Economy Initiative) consisting of a new strategy, starting with the 2015 priorities Within the European Parliament, reconstituting the Social Economy intergroup Within the European Council, organizing regular meetings of the Ministers whose competences include the Social Economy and creating high-level expert groups at the national level. 4 2. In the course of the upcoming mid-term review of the Europe 2020 strategy: 2.1. To recognise the unique role of the Social Economy in attaining the objective of smart, sustainable and inclusive growth To develop straightforward guidelines, monitoring and reporting tools for national and regional authorities concerning the implementation of the public procurement directive at the national and local levels To expand the modes of partnership between the public sector and social economy organisations within a logic of subsidiarity, co-design and co-production To monitor and report the extent to which European Structural Funds are being used at the national and regional levels to promote and support the Social Economy. 3. The Investment Package announced by President Juncker should target not only physical infrastructure but also social investments involving social economy actors, in the same proportion adopted for the Structural Funds. 4. To improve the availability of funding options and financing solutions for the Social Economy by: 4.1. Encouraging traditional banks to enhance their risk assessment practices in order to more accurately estimate the risk associated with lending to social economy organisations Promoting the creation and strengthening of dedicated financial instruments and institutions Increasing lending and equity participation by creating dedicated guarantee funds Encouraging social economy actors to mobilise their own financial resources for the development of the Social Economy, e.g. through the creation of mutualistic funds. 5. Considering that social impact measurement remains a non-consensual issue, further dialogue between the Commission and social economy organisations is necessary. Before proceeding further, it is important to facilitate an exchange of information among all the relevant stakeholders and to carefully monitor and evaluate early experiments. 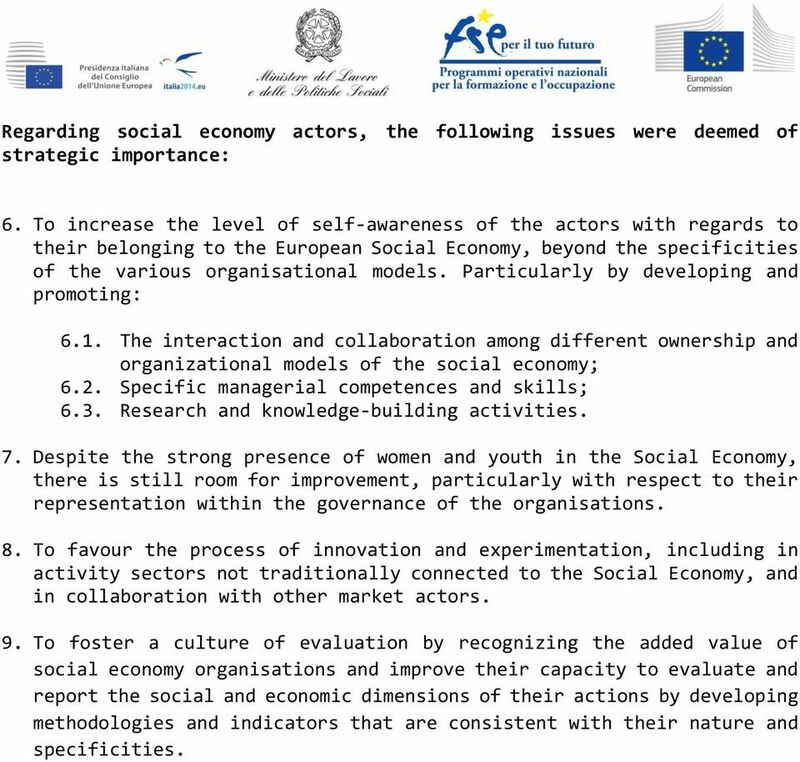 5 Regarding social economy actors, the following issues were deemed of strategic importance: 6. To increase the level of self-awareness of the actors with regards to their belonging to the European Social Economy, beyond the specificities of the various organisational models. Particularly by developing and promoting: 6.1. The interaction and collaboration among different ownership and organizational models of the social economy; 6.2. Specific managerial competences and skills; 6.3. Research and knowledge-building activities. 7. Despite the strong presence of women and youth in the Social Economy, there is still room for improvement, particularly with respect to their representation within the governance of the organisations. 8. To favour the process of innovation and experimentation, including in activity sectors not traditionally connected to the Social Economy, and in collaboration with other market actors. 9. To foster a culture of evaluation by recognizing the added value of social economy organisations and improve their capacity to evaluate and report the social and economic dimensions of their actions by developing methodologies and indicators that are consistent with their nature and specificities. Daily scoops, or policy imperative? Balancing social and commercial objectives within business organisations what can we learn from social enterprise? Balancing social and commercial objectives within business organisations what can we learn from social enterprise? Introduction The accepted role of business in our society has changed in the last 15 years.